March Astro Babble ~ Your Personal Horoscope Included! Happy Spring! This month the Sun moves from the watery depths of compassionate, soulful Pisces to fiery, take-charge Aries. Quite a shift! Ultimately, because both signs are present (in different planets) throughout the month, the key is to find middle ground between these two divergent energies. A great archetype would be that of a Soulful (Pisces) Warrior (Aries). Like cosmic bookends, we also have two Full Moons, one on the first day of the month and the other on the last day. Full Moons heighten the energies of the sign they illuminate, here in Virgo and Libra, respectively. 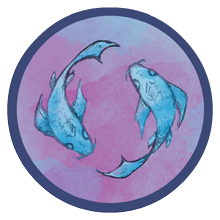 The New Moon is in Pisces falls in the middle of this lunar sandwich, offering a time to integrate, especially on an emotional level. Leo: Your stars are shouting: Career! No pressure, but this is a moment to give deep consideration to your presence in the world. What is your true identity and how do you wish to express it to others? You’ll what to make sure that your values, your truth and your creative self is all represented in the equation. (Again, no pressure!) Leo, because your light is so bright, it’s hard for you to fake anything. The more authentic you become, the more others will get it. #Roar!